Blood Red Road is a fabulous piece of dystopian fiction. Moira Young's first novel is packed with action and adventure; there's no slowing down once young Saba sets off on her journey! Saba's twin brother is kidnapped and in order to get him back she'll have to cross the dessert, protect her little sister Emmi, and most importantly, survive. There are so many obvious reasons to pick up this novel: it's dystopian, it's original, and most of all, it's intriguing. Young's writing style is fluid and the narration flows evenly, even though the characters have a peculiar way of speaking. The way the characters express themselves is so real and humorous that you'll find yourself feeling as part of the conversation or action. The suspense of Blood Red Road is subtle, but there are little movements, looks between characters or phrases, that gives you the feeling that there's more to the story than Young is giving. Saba's world is set in the future where cities lie abandoned and technology is but a novelty from the time of the Wreckers. It's revealed that people are ruled by a ruthless king who has the monopoly on a highly addictive drug and the world is incredibly dangerous. Saba's task is daunting, but her strength and stubbornness leads one to believe that she can handle anything. Saba is a female protagonist readers love to root for. She's fiercely independent, not always right, but you love to watch her grow into a better person. Saba's journey is physical and emotional and it takes the people she meets along that journey to help her through it all. 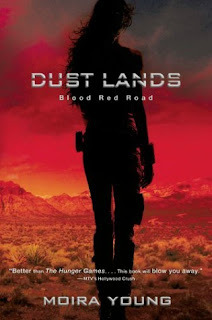 Dust Lands is a series worth continuing because there's so much more to discover and Saba surely has an exciting future. I really loved this book and can't wait for the sequel, Rebel Heart to come out in a few months! I really hope it is as good or better. Glad to see you liked it too! I just got this one and it sounds great. Looking forward to reading it more than ever. Thanks for sharing!